BUDDHADHARMA : The Four Seals : Are You (not) a Buddhist ? The Four Seals : Are You (not) a Buddhist ? What is the view of Buddha Śâkyamuni ? Or : How can we swiftly & precisely answer the questions : "Am I (not) a Buddhist ?" The primary concern of Buddhism is wisdom, the mind realizing emptiness, the true nature of phenomena. Ethics is a preliminary. This wisdom mind has "the right view". One who has "right view" is, in principle, a Buddhist. This "right view" is a fourfold set of tenets each having to be affirmed (or negated) to be a Buddhist (or a non-Buddhist). nirvâna : is true, ultimate peace, in other words, suffering may cease. If one accepts things are self-powered, possessing their own, essential, substantial, unchanging nature, a final ground "cut off" and independent from all other self-powered things. If one accepts contaminated things (like afflicted & non-afflicted emotions & mental obscurations) are pleasurable, really satisfying one's cravings. If one accepts every thing appears as it is, i.e. substantial, self-powered & inherently "cut off" from all other things. If one thinks the fruit of spirituality (enlightenment) exists within the spatio-temporal world-order(s). The view is the core of any religious system. It is the final reference point defining whether a physical, verbal or mental action (like thoughts, emotions or volitions) is justifiable in terms of the system. In classical logic, when two systems cherish radically different views, they cannot be said to be both true. So before starting debate, the participants need to agree on the logical system they will use. Both Western & Eastern philosophy accept the rules of classical logic (with its identity, non-contradiction & excluded third). Despite the fact these basic principles may just be an exception of the more general case of quantum logic, we need them to first clear the mind from common sense delusions. Take Mediterranean spirituality. Although polytheism, henotheism & monotheism entertain different concepts of the Divine, they share the theist axiom and so posit a Being so Supreme it is entirely self-powered, ultimately existing from its own side, absolutely sovereign and so fully in control. Omnipotence is the core feature of this Supreme Being. As absolute absoluteness, it is so ultimately perfect for it to necessarily exist & necessarily create, for non-existence would make it less perfect. In Platonic style, this Supreme Being equals Supreme Existence (cf. Does the Divine Exist ?, 2005). Likewise, the sophisticated schools of Indian philosophy (like Sâmkhya, Yoga & Vedânta) also introduce a Supreme Creator, Brahman manifesting as Brahmâ. Only in the so-called "Dharmic religions", like Buddhism & Jainism, is such a Supreme Creator not found, although some phenomena are still called "Divine". The Dharmic religions are not atheist, but nontheist, or better, transtheist. Philosophically, only one view can be true. As wisdom, the fruit of right view, is the heart of the Buddhadharma, both conventional and ultimate truth are its core business ("dharma" comes from the verbal root "dhr", meaning "to hold, to carry, to possess"). Analyzing how the superimposition of own-power works, the critical mind is able to affirm radical nominalism. First in terms of the illusion of a permanent ego, then unmasking the permanent others. Once this is done, the assemblies or aggregates constituting every concept of the Divine are deontologized (deconstructed). This purifies the conceptual mind. This step is followed by training the ability to stop the production of concepts at will, thereby resting in the acute awareness of the moment at hand, clearly present in it. Just like all other concepts, a concept of the Divine is functional, but does not inherently exist "from its own side", i.e. as self-powered, as it appears. Transforming this Supreme Being deemed an unchanging, own-powered substance into an other-powered process-Deity calls for the negation of its omnipotence, for as soon as interdependence is accepted, sovereignty is lost. However, loss of omnipotence is not loss of Supreme Generative Power through a infinitely vast network of interconnected functional, co-relative events. On the contrary, no longer a closed monad, Deity is the multiversity of one, pan-sacral, unbounded wholeness. This empty, omniscient but highly functional (interrelated) & interstitial Deity is the object of Buddhist Deity Yoga, the "turbo" method of the Diamond Vehicle. 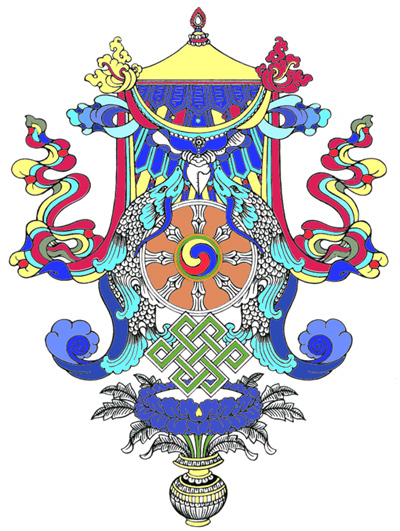 The views expressed by the Four Seals apply to the whole Buddhadharma. Co-relatively, all paths or methods are also based on them. Anything which contradicts one or more of the Four Seals is non-Buddhist. All four need to be present for a teaching to belong to the Buddhadharma. Among parts, other-power prevails, and so inherent stability & permanence of essence (substance) cannot be found. All phenomena originate dependent on unique causes and conditions (cf. "dependent arising" or "pratîtya-samutpâda"). Subjectively, consciousness attributes conceptual meaning to sensate & mental objects. This process of attributing, positing and designating labels to sensate objects and those of thought, affect & volition, when correctly pursued, gives rise to conventional truth. This truth is relative, provisional, contextual and ever changing. Criticism affirms how the conceptual mind, with its proto-rational, formal, critical & creative modes of cognition, is unable to eliminate interpretation, ever retracting from facing whatever there is ("dharmadhâtu") and this because of the intervention of a hallucinated "substantial" ego, a monolithic focus of consciousness, an own-powered "reality-for-me". All these aggregates, sub-aggregates, etc. are driven by processes and nowhere among assembled, compounded objects is anything stable to be found. Sensate objects are ever-changing. Mental objects are "given" stability by a volatile conscious intent. The "ego" established by the first person perspective exists, but not as it appears. It is not apart from or identical with the body. It exists as a function of the aggregates. It merely rides the windhorse. Objectively, material forms are constituted by particles and particles are constituted by sub-particles, etc. The final ground, a virtual quantum field, is itself in constant movement, with particles shifting in and out of "existence". Apparently, this flashing in and out of "existence" is the fundamental basis of the "solidity" of sensate objects. This process can only work if no element in the assembly of aggregates cluttering from micro-, to meso-, to macro-cosmos is "stuck", always resists change. Because of the division in parts, an overall impermanence is at work, one not excluding transient architectures. Emotions are affects satisfying the needs of an ego without considering the other as such. Non-afflictive emotions satisfy a selfish need without causing harm, like eating wholesome food properly cultivated by oneself to appease hunger. But afflictive root-emotions ("kleśa") like hate, greed, stupidity, exaggerated attachment (craving), arrogance & pride cause massive harm. Feelings like joy, gratefulness, love, compassion etc. are affects always satisfying needs both ways, through harmony, symmetry and reciprocity. They are non-afflictive. But in the long run, they too are prone to change and so fundamentally unsatisfactory. They do not provide lasting, irreversible peace, the end of craving & hatred, of grasping and rejecting. And this is what the Buddha found : lasting, true peace. Owing to this instability, this coming to an end or ceasing of objects, sentient beings live woefully. Conversely, owing to the selfsame instability etc. Buddhas dwell at ease (cf. Samyutta-nikâya). Liberation from suffering is dependent on the very nature of suffering itself. Indeed, all woe is interdependent and not self-powered. The fundamental error of ignorance consists in reifying the data of the senses as well as the objects of the mind. When this happens, objects are established by way of their own character. Because something is functional, i.e. able to "work" or perform a certain task, the deluded mind thinks this functional objects must exist in a permanent, ultimate, substantial, independent and essentially own-powered way, as it were "cut off" from its environment and other objects. The conceptual mind designates (projects) ontological auto-sufficiency on its objects, attributing to them the capacity to arise, abide & cease independent from anything else. To view this self-power or self-nature as the ultimate truth, leads to wrong actions, causing afflictive emotions, ending in endless forms of suffering & unsatisfactoriness. In truth, all phenomena are other-powered, i.e. under the influence of conditions & determinations (like causes) other than themselves. If they were own-powered, they would not be able to perform functions at all ! Here, "unchanging" means permanent in all dimensions, without exception, even after thorough, so-called "ultimate" analysis. Ultimate truth sees all phenomena as devoid of substance, permanence and independence. Every sensate or mental object arises, abides and ceases according to causes and conditions and so every conventional reality is provisional, only "for now". Because we experience functioning things, this does not mean these experiences and their related objects exist in an "ultimate" way, namely as they appear. The ultimate reality of every phenomenon, its emptiness, is precisely the lack of inherent existence. In classical logic, this lack cannot affirm anything else except this absence of substantiality. It implies a non-affirmative negation, leaving no choice. Itself devoid of inherent existence (the emptiness of emptiness), emptiness is not the "substance" of phenomena. Hence, emptiness is the ultimate characteristic of every single phenomenon. "Samsâra" without reification is "nirvâna". Appearances are not binding, but one's substantializing attachment to them is. In any rational presentation of the ultimate nature of phenomena, the difficulty consists in that our languages are steeped in the Aristotelian distinction between substance and quality. Consisting largely of nouns, anything designated by way of language becomes "a thing", i.e. an "ousia" (substance) with properties. By extension, the "world" is designated as made up of physical and mental objects. Adding adjectives to qualify a noun, we add "thingness" and perform an entitative, static reduction of the ultimate nature to the conventional nature of phenomena. This may also happen with "nirvâna", called in the Pâli Canon "a place hard to see", "an island in a stormy sea", "a dimension that cannot be localized" or "a foothold that does not slip" etc. In a structure-oriented approach of the path, "nirvâna" is linked with a conception of a process having come to an end (cf. the image of a flame becoming extinguished). The goal is an end state and in many ways resembles a dead end, which is not the case. Considering ultimate truth thus, is projecting it out of the present moment into a very far (or near) future. This is precisely the way the deluded conceptual mind works. The same reification may happen when the adjective "Buddha" is used as a noun. As a past participle of the verb "budh", or "to awake", it does not denote a thing of the world, neither a static, experiental "state" of being "fully awake". Hence, "the Buddha" is not some object, and is best not approached by way of a view positing "states" and "structures". Instead, just like "nirvâna", Buddhahood points to a continuous, never-ending process. In the Mahâyâna, "nirvâna" is equated with the ultimate state of the Lesser Vehicle, i.e. Arhathood, involving personal liberation or the release from "samsâra", the cessation of personal suffering. Buddhahood, implying omniscience, is a higher state, achieved by generating Bodhicitta, the intention to enlighten all sentient beings, not just oneself. In Tibetan Buddhism, seeking the sense rather than the literal meaning, "Buddha" is translated as "sangs-rgyas". "Sangs" means "wiped out, cleansed, purified, awakened, free from", and "rgyas" means "increase". A classical Mahâyâna interpretation would be to say a Buddha removed what is to be removed, and increased what must be increased. However, is there, at the end of this process of removal and increase, anything more to be done ? Does this interpretation not again frame a static understanding of Buddhahood and true peace ? Buddha Śâkyamuni does not seek a heaven or an unchanging, problem-free area, a sophisticated, subtle existence similar to our current one, but one without trouble, problems, suffering, etc. The Buddhadharma has no salvic topology. In fact, "nirvâna" is not a place at all. It falls outside space, time & conceptualization and so cannot be compared with the many heavens of the ancient or contemporary religions, whether they be Ancient Egyptian, Pagan, Hindu or Abrahamic. It is not companionship with Osiris or Re, not a realm of Devas, not a Garden of Eden. These are all reified states, based on the hope to continue conventional existence ad aeternam. Buddhahood is beyond the Arrow of Time. Given a calm mind & a good heart, this can be prehended in the sheer actuality of every moment. Although entering "nirvâna" may be understood as a joyful state of bliss, this station-of-no-station is beyond happiness and unhappiness. The ultimate is a release from the chains of ignorance and its delusions. The way of the Buddha does not lead to happiness, but to freedom from suffering by being free from ignorance and its confusions. It leads to a blissful state devoid of happiness & unhappiness, to true peace. This is possible because the ultimate nature of sentient beings has, is and will remain enlightened. This Buddha-potential is a given, and so does not need to be acquired. The stains or obscurations covering it need to be removed (or, in other words, the emptiness of the mind has to be thoroughly realized). That is all. Entering this unbounded wholeness leads to unending symmetry-transformations. Although the deluded mind considers a dirty glass as inherently "dirty", it is only dirty because of the dirt & the fingerprints on it. Wash these off, and the original, clean glass emerges. Likewise, "nirvâna" is not to be attained, it is to be (re)discovered, or better, recognized. The glass (Buddha-potential) is not inherently dirty. If the glass were inherently dirty, then one has to get rid of the glass itself and replace it by a "pure" glass. But this is not the case. We only need to make the effort to remove the impurities appearing on the glass due to transient causes & conditions. When this is done, the original glass arises. This is not a tranformation, but a mere elimination, like blowing away the clouds shielding the light of the Sun. The Buddha affirms it is possible to remove what obscures. We should trust having Buddha-potential. He does not teach us to wash our dirty clothes with mud-water or blood with blood. By accomplishing the elimination, awakening happens. The word "Buddha" can be defined as having the aspects of "accomplishment" & "awakening". Liberation and recognizing ultimate truth are simultaneous. Despite sublime poetry, enlightenment cannot be conceptualized. It is the result of the exhaustion of defilements and the exhaustion of the antidote of the defilements. This is what reason teaches. Moreover, being empty of stains, once the potential actualized, it is also full of Divine Buddha-qualities.